With school about to start, I thought I would make one more hat pattern before I am consumed with studies about extinct animals and weekly 15-page physical chemistry lab reports. This is a hat that I've been meaning to try for some time now and I think it turned out well. 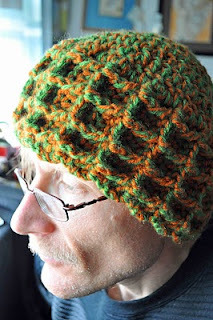 It is a little bit more complicated than the other hat patterns (because it uses front post double crochet (fpdc) stitches), but it is definitely not the hardest pattern I've ever completed. To see a child size version of this hat, see this blog post. Note: For the hat that is pictured, I used two worsted weight yarns at the same time. I believe the same can be accomplished by using one bulky weight yarn. Row 1. Ch 14. Dc in third ch from hook. Dc across. Ch 2. Turn. Row 2. Dc in first st. *Dc in next st, fpdc in next 2 sts. Repeat from * twice more. Dc to end. Ch 2. Turn. Row 3. Dc in first st. *Fpdc in next st, dc in next 2 sts. Repeat from * twice more. Fpdc in next st. Dc in last st. Ch 2. Turn. Repeat Rows 2 and 3 until piece measures approximately 20 inches long. End with Row 2 and ch 1 instead of ch 2. Fold the piece in half so that the first row is next to the last row (with the waffle pattern facing out). Slip st together each st of the first row and the last row. Ch 2 at the end. Do not turn. Round 1. Dc 47 sts evenly across the top of the waffle stitch base. This roughly correlates to 3 sts per waffle square. (Note: I chose 47 because that appeared to the be the number when there wouldn't be any visible holes between dc sts.) Join with sl st to first dc st of round. Join in this way throughout the rest of the piece. Ch 2. Do not turn. Round 2. Dc in st that was slipped to (start each round this way). Dc 1 in next 4 sts. Dc2tog in next 2 sts. *Dc 1 in next 5 sts, dc2tog in next 2 sts. Repeat from * around. End with dc in last st. Join. Ch 2. Round 3. *Dc 1 in next 4 sts, dc2tog in next 2 sts. Repeat from * around. Dc in last st. Join. Ch 2. Round 4. Dc2tog in first 2 sts. * Dc 1 in next 3 sts, dc2tog in next 2 sts. Repeat from * around. End with dc 1 in next 2 sts, dc2tog in last 2 sts. Join. Ch 2. Round 5. *Dc in next 2 sts, dc2tog in next 2 sts. Repeat from * around. Join. Ch 2. Round 6. *Dc in next 1 st, dc2tog in next 2 sts. Repeat from * around. Join. Ch 2. Round 7. Dc2tog around. Join. Fasten off. 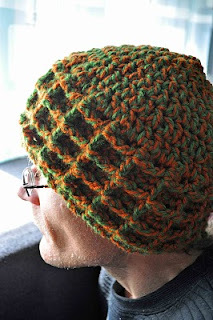 Weave yarn through last 8 stitches and pull tight to close the top of the hat. Weave in ends. Another fabulous pattern-you have talent, and so young! I look forward to seeing what's next. Thank you sooo much for this pattern! It has become my favorite to make for my "Hats for the Homeless" project. It makes up quickly and is so comfortable and warm! Thank you! Thank you! Thank you! Do you know how much bulky yarn this uses?